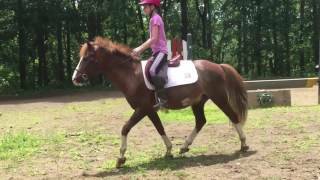 2007, 12.2 pony gelding. Valentino is the ultimate packing machine to teach your rider the ropes. He is beginner/timid rider approved and never puts one step wrong. He can take your kid from the lunge line to the pony ring. Valentino has automatic lead changes and jumps a 10. 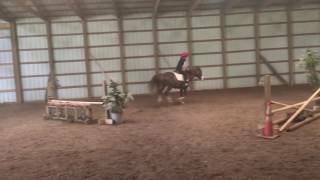 He always takes care of his rider and will step over cross rails for his rider that is just starting to learn how to jump. He has no spook, buck or rear. Easy keeper and requires zero prep. Valentino has loads of show miles from the cross rail to short stirrup ring with many different kids at the local level and even though he is a horse show pro, he still has his green status for the pony division. He would also make a great addition to any lesson program - he never strays from the rail unless told to, and maintains a easy pace at the trot and canter. All the rider has to do is ask him to go and work on themselves while he does the rest of the work. Valentino is a kick ride and can be ridden daily or once a month, he will always come out the same. He has a big stride to make it down the division lines and is the ideal safe and consistent ride that a trainer is looking for. 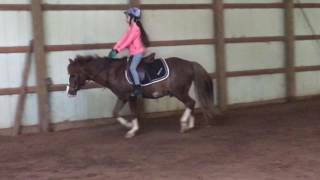 Valentino also has super ground manners, any level kid could get him from the field, tack up and ride without help. He is also great out on trails as well!